That was a very satisfying moment during Avengers: Infinity War. Avengers: Infinity War stars Robert Downey Jr., Chris Evans, Chris Hemsworth, Chris Pratt, Mark Ruffalo, Scarlett Johannson, Benedict Cumberbatch, Benedict Wong, Tom Holland, Bradley Cooper, Vin Diesel, Chadwick Boseman, Elizabeth Olson, Paul Bettany, Josh Brolin, Zoe Saldana, Dave Bautista, Pom Klementieff, Gwyneth Paltrow, Anthony Mackie, Sebastian Stan, and more. Chances are that, at some point during the above paragraph, you stopped reading. 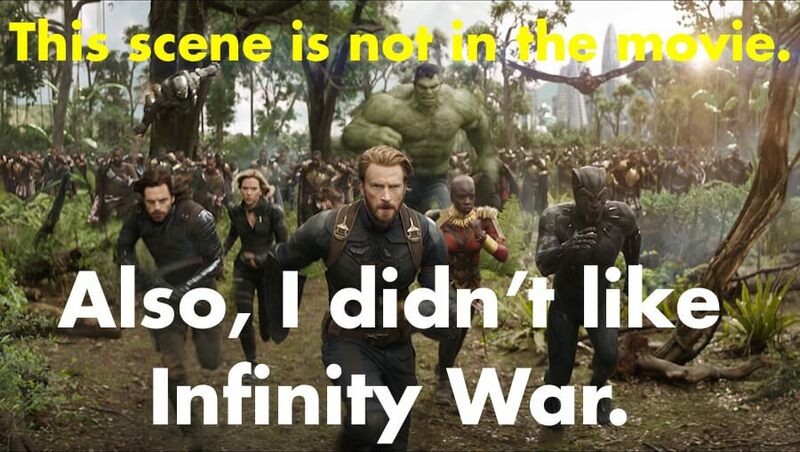 Such is Infinity War. This is the film version of dumping out your toybox and slamming all your favorite toys together. To be fair, there’s a visceral thrill in seeing the MCU characters come together. I cheered when the Avengers theme song roars in for the first time. I gasped at the return of certain characters. You get to see the Guardians of the Galaxy play with the Avengers, all of whom are finally fighting Thanos. The thing you’ve been waiting for for 6 years is here and you can go see it. The plot is driving the characters this time and not the other way around. Even at its bulkiest (Captain America: Civil War), Marvel has a good sense of character. They’ve show that, if you want people to keep coming to your movies, you have to give the characters a life outside of their masks. None of that rich understanding is here. The only fleshed out character here is Thanos, who is unusually sympathetic for a villain who literally wants to kill half the universe so everyone will be more prosperous. He is the film’s best, most interesting, most emotionally affecting, most heartbreaking character. And he’s also a despotic wannabe who wants to kill half the universe. It’s akin to creating a Hogan’s Heroes movie where you sympathize the most with Hitler. Each character in Infinity War gets the barest of re-introductions, then crash right into the plot. The Guardians literally crash into Thor. Bruce Banner crashes into Doctor Strange. Iron Man, Spider-Man, and Doctor Strange crash into a planet. Then the Guardians crash into those three characters. The next scene with Peter is him fighting the bad guys. You do get to know and like him a bit more, but it’s just another gust in a whirlwind of information that’s comes at you at breakneck pace. The movie is also a sequel to Thor: Ragnarok, Captain America: Civil War, Black Panther, Spider-Man: Homecoming, and Doctor Strange (I’m probably forgetting something). So it’s dealing with 5 other storylines, and also Thanos. The doesn’t bother giving any of these characters a beating heart within the context of this story. So, when Infinity War unleashes the traditional “Avengers have to fight an army” trope that has now been codified, I didn’t care at all. I’ve never had a problem with Marvel’s quipping in movies. It was first an extension of Tony Stark and his detachment/coping mechanism/”Save the Cat” in Iron Man. It was then incorporated to great use during the climax of The Avengers. In a movie that is already asking the audience to do so much emotional heavy lifting, we now have to sift through the HA-rricane to care about what’s going on. The Guardians of the Galaxy are not organic extensions of the “story.” Gamora is the daughter of Thanos, but involving her involves 6 other characters in an already overcrowded movie. Ultimately, the Guardians serve as intergalactic ferries for Thor and for Gamora to get dropped off, kidnapped by Thanos, and then sacrificed to get another Infinity Stone. It reeks of, “Well, it’s been awhile. We should get them together” as opposed to giving these characters a reason to be together. They do nothing. And then they’re all killed off (except for Rocket). I love and hate that ending. I love that the entire audience was kind of bummed out at the end. I hate it because it’s not reflective of any greater purpose. Movies don’t always have to be burdened with glorious purpose. But, if you choose to kill off 5/6 of the Guardians, Doctor Strange, Spider-Man, Black Panther, and more, then why are you doing it? For shock? That reeks of mystery box storytelling that tells the audience to come back next year for the rest of the story. For reflections of theme, talking about the fallacy of heroism? Certainly not, as the movie has no greater meaning besides the toybox smashing metaphor. I also hate that it now means Marvel will cure death by the end of Avengers 4. Which means every modicum of raised stakes via death is now rendered completely hollow. Loki and Heimdall’s death in the first 10 minutes? Meaningless. You can reset it all. The Avengers go on no journey here. They remain in stasis, which is unusual given how Marvel changes up the status quo so frequently. Nor is their stasis of any real purpose – it only reeks of marketing choices and marking time before the REAL finale of Avengers 4. The only change is in the last 5 minutes, where the status quo is actually reversed by shrinking the Avengers back to the original 5 (Hawkeye’s a maybe, we still don’t know yet, but…come on). Hopefully, this bodes well for the final OG Avengers movie, as there will be fewer characters to deal with. But, if the quality of Marvel’s product continues is anything like Infinity War, then Marvel is on its last legs. I saw the 7:00 PM showing on Thursday, April 26, 2018 at Regal Westgate 11 in Austin, TX.